Did you know you can find ind amazing movement and tonalities in Cambria’s durable wood-inspired designs? Read on to discover more. Cambria’s American craftsmanship and industry-leading innovation let you achieve the wood look you love for your kitchen countertops and other surfaces without sacrificing performance. 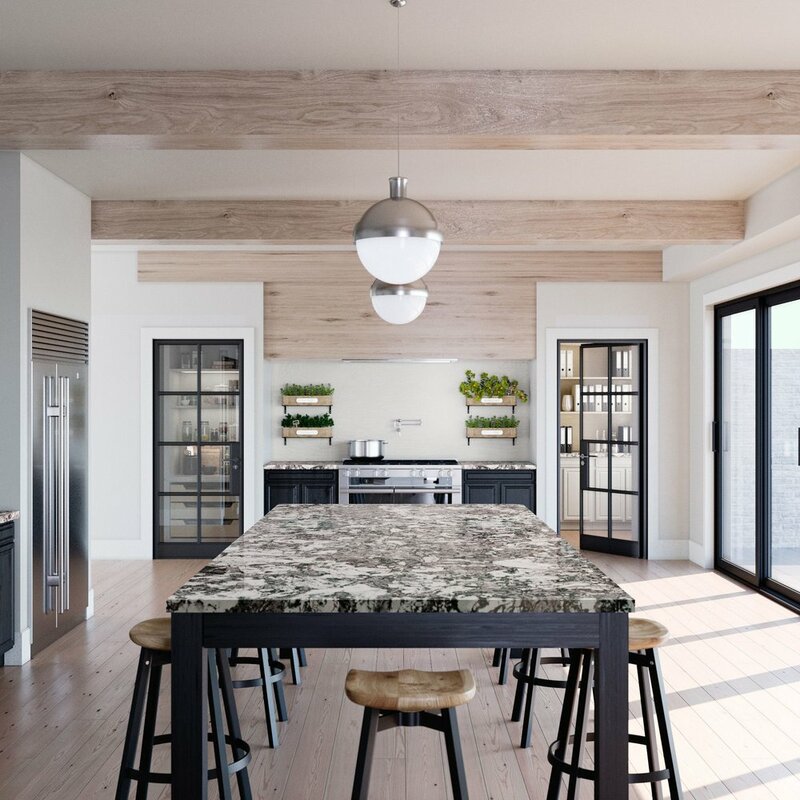 Cambria designs like Clairidge™ and Oakmoor™ beautifully emulate natural wood and butcher block movement and tones while providing unbeatable durability and maintenance-free benefits. Unlike wood or butcher block, Cambria offers optimal scratch and chip resistance that provides peace of mind for life. Wood countertops can be stained easily. Cambria is nonabsorbent, so spills don’t become stains and it won't draw in moisture that can harbor harmful bacteria. Wood countertops require regular maintenance. Cambria doesn’t require sealing or polishing, and cleaning it is as simple as warm water and a soft cloth. Mild soap is optional. As we all know, the countertop is one of the hardest working products in your home. Whether you’ve selected a surface for your kitchen, bathroom, laundry room or furniture, we know you expect it to perform for you & your lifestyle. That is why we love offering Cambria as our exclusive product - not only does Cambria provide the most beautiful & innovative countertops available, they also back them with an unparalleled warranty. We thought we’d share some of the high points of the wonderful warranty included in the purchase of your Cambria countertop. Cambria surfaces are backed by a Full Lifetime Warranty to ensure you enjoy years and years of flawless service. To care for and protect your Cambria, a few precautions are recommended. Cambria® is handcrafted, using pure natural quartz, American ingenuity, and artistic innovation to make the world's finest countertops. This quality enables Cambria to proudly offer a Full Lifetime Warranty. Cambria offers a Full Lifetime Warranty against manufacturing defects. Feel the confidence and freedom of living with your Cambria, knowing that they stand firmly behind every product they make and every customer we earn. In the rare case that your Cambria has been damaged, their Customer Care professionals will help make everything right. To learn more about Cambria’s Lifetime Warranty, click here. As much as last week’s blog post touted the benefits of using sophisticated colour in the kitchen, he have to be honest when we ask: Will the black and white kitchen ever go out of style? Of course not! From now until eternity, black and white will be a chic choice for kitchens, partly because of the timeless nature of true neutrals but also because of their infinite flexibility. While we think pretty much any interior design direction has merit (Pastels? Sure! Neon? Why not? etc.) as long as it reflects the lifestyle & tastes of the homeowners, today we’re sharing two very simple & minimal kitchens that share a monochromatic colour palette yet nevertheless result in totally different feeling spaces. First up, this stunning kitchen features a Blackpool Matte waterfall kitchen island & perimeter which oozes refined glamour. Paired with black appliances & plenty of brushed gold accents, this space has a definite Gatsby-inspired feel! The bones of this kitchen are truly timeless - white cabinets, black hardware & subway tile backsplash. The magic of this space is created almost entirely through accessories & styling - from the plants to the incredible leather bar stools. Of course, we cannot overlook the incredible custom island with gold inlay. If there’s one element of this kitchen that screams luxury - it’s this amazing piece. Blackpool Matte: Vast and commanding, this powerful design is darkest ebony with a stealthy silken Cambria Matte™ finish that absorbs light like a starless night over the Irish Sea. Blackpool Matte is a luxurious statement with a tactile feel which feels soft & comfortable. The matte finish offers a silky-smooth, low-sheen alternative to Cambria’s standard high gloss finish, with a modern & opulent look. The next kitchen we’re sharing also features a gorgeous Matte finish countertop - this one in Cambria’s White Cliff Design. This space has a completely different look & feel - rustic yet refined, minimal yet cozy. Scandinavian- inspired reclaimed wood cabinets & a contrasting black stained wood island dovetail perfectly with the smooth, white expanse of the White Cliff countertop. In a space where texture is so integral to the design, we love the choice of a Matte white countertop. Reflecting light or sunshine won’t be an issue thanks to the flat quality of the Matte finish. It also adds to the modernity of the design - it is both unexpected & understated. White Cliff: Pure and unsullied is the essence of White Cliff. Named after the chalky White Cliffs of Dover, this whitest of whites makes a statement of grand proportions. What do you think of these two completely different spaces? We love that both feature a monochrome Matte finish countertop, but achieve completely different aesthetics! Would you consider a monochrome countertop for your home? There is a definite shift in the interior design world away from true neutrals (black, white, beige & grey) and towards using colour in a sophisticated way to create the calm & intentional feel neutrals bring to a space but with added character & uniqueness. Common colours that are subbed in for classic neutral tones are camel, tan, navy, and lately, olive green. While many people may hear the word ‘olive’ and be turned off - we prefer to think of these refined hues as bronzey-green. While definitely still a green, this particular hue has a gorgeous & complex undertone that brings warmth to any space, while being subdued enough to have true design staying power. We’re going to share a few spaces that are using this beautiful shade in different ways! First up, of course we have to mention a space featuring one of our favourite Cambria designs! This space is mixing neutrals perfectly. There is plenty of layered textures & tones of wood to create interest & warmth, but simple modern shapes keep the space feeling fresh. Of course the reason we’re including this kitchen here is for the choice of countertops. Skara Brae is a dramatic & beautiful design which at first blush doesn’t strike you as olive green - which is perfect! The layered tones of warm green build on each other to create an incredibly natural looking vein set against a bone-white background. We think that using Skara Brae is an excellent way to incorporate a ‘new’ neutral into your design, without the commitment of a large splash of colour. Above, this incredible bathroom has so many incredible design features! Pairing a gorgeous green vanity with Cambria’s Rose Bay design countertop is a lovely way to tie together the other black & white accents of this space. Using a fun pop of colour through the rug is a great way to add a bold shade like red, while being easy to switch out if it starts feeling tired. Especially eye-catching is the way the olive green vanity looks paired with the smoked glass shower doors - a stunning mix of modern boho & mid century features! Above, this kitchen is absolutely stunning. A gorgeous mix of classic features is updated with the incredible green hue of the cabinets. We love that although green cabinets are definitely an unusual choice, in this space everything has been balanced so perfectly it is difficult to imagine it without them! The gorgeous countertops are a classic white & grey with bold veins - if you’re looking for a similar design but with the added durability & no-maintenance properties of Cambria we highly suggest our Brittanicca design for a similar look! Kitchen Trend: No Upper Cabinets? Today we’re sharing some inspiring kitchens. These spaces feature beautiful cabinetry, fabulous backsplash & delightful styling, but they also share one thing in common: the lack of upper cabinets. This design feature has been gaining popularity over the last 5 year. First we saw the introduction of open shelving or glass fronted cabinets - sometimes including light features but always allowing a peek at treasured collections of glassware, cookware or serving ware. However; as this trend has gained popularity, it has dovetailed with the movement of the ‘unkitchen’ - a space which features less of the traditional cabinetry & layout we have grown accustomed to, and moves more towards integrated cooking & living spaces with distinct pieces of furniture intended to look collected, curated & reflect more closely the way these spaces are used & the people who live there. We’re excited to see where the ‘unkitchen’ trend goes - but for today we’re focusing on one feature which many ‘unkitchens’ utilize - open shelves instead of upper cabinets. This kitchen uses floating shelves to display a minimalist collection of wooden bowls & the most often used kitchen items - glasses, plates, bowls & mugs. One consideration for open shelving is certainly whether they will require additional maintenance in terms of cleaning or dusting. The consensus seems to be that if you use your items frequently, dust is not an issue. This is a lovely way to incorporate utility into your kitchen - if your floating shelves feature most-reached-for items, you’ll have easier access to them! This kitchen has similar floating shelves flanking an oversize range hood - but it also shows a popular feature of a kitchen without uppers - a large pantry! 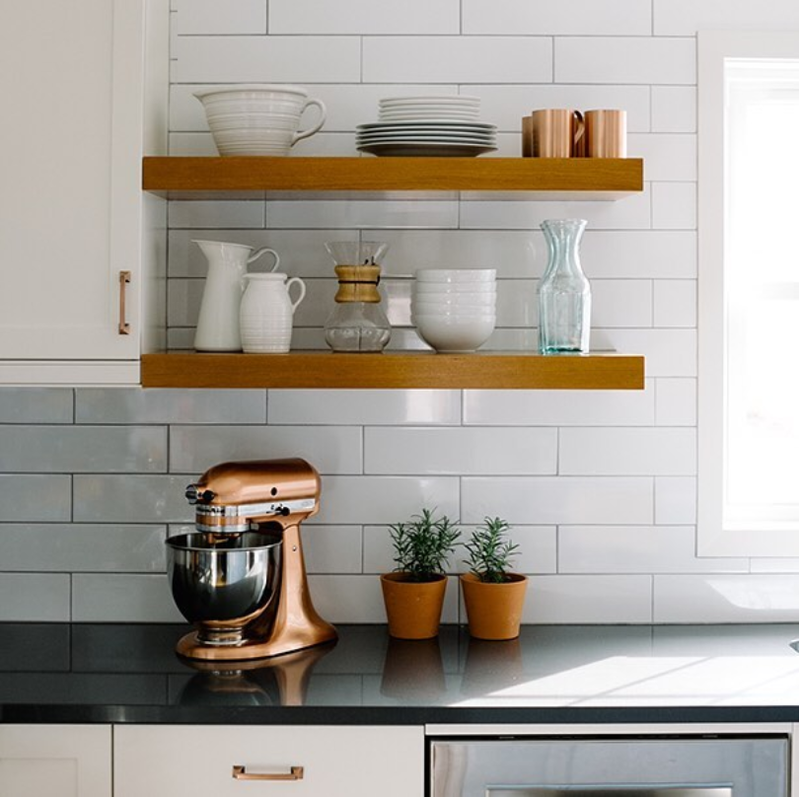 While the floating shelves are often a way to create a serene & orderly visual for a kitchen, the fact remains that these spaces are the workhorses of our homes. That means food storage is an essential consideration. Many homeowners who opt for open shelving find a way to incorporate a large pantry into their kitchen design. The plus to having one large pantry instead of several cupboards containing food is that you can see at a glance what your kitchen has stocked & everything should be within arm’s reach. If you aren’t convinced of open shelving’s utility, or you simply prefer the look of cabinetry, this kitchen is a gorgeous example of how you can incorporate a small area of open shelving to display beautiful objects. We love these three shelves between more traditional cabinetry, it is a little bit of the best of both worlds! As always, while trends will come & go, the true barometer of style is what works for your family & lifestyle. Whether you like a lot of open shelves or none at all, the only design rule we adhere to is that you love the space you’ve created! The days are getting longer and spring is visible on the horizon, despite the piles of snow outside our doors. As the sun regains its strength we think most people are readying themselves for the upcoming season of increased activity. Whether you are in the planning stages for an upcoming home renovation, or are simply considering a smaller scale refresh (swapping a countertop is an easy & relatively non-invasive way to update a kitchen or bath!) we thought today would be an excellent chance to spotlight a few designs which bring to mind warmth, comfort & of course, the timeless beauty of Cambria. While cool-toned neutrals have reined supreme for nearly a decade, we’re now seeing a shift in the market toward warmer tones. Everything from deep rust to lightest cream is fair game in home design, and we’re enjoying seeing how designers and homeowners work together to create spaces that feel unique, warm & welcoming. Today we’re sharing 5 warm neutral toned designs we think stand out in a crowded marketplace of surface products. Each of these designs offers the singular beauty of Cambria. Due to Cambria’s incredible quality control & unparalleled access to the purest & most beautiful quartz, each of these designs has even more stunning depth & life in person. If you’d like to see any (or all!) of these designs in person, you are welcome to stop by our offices to take a peek. We’re open 8:30am-5pm, Mon-Fri & are located at 355 Harry Walker Pwky N, Newmarket ON. Without further ado, here are 5 warm neutrals sure to inspire a warm & wonderful space for your home. Crowndale™ is an intriguing combination of warm cream and beige splashes that meld with darker tans to articulate an intriguing design statement. Warm cream and beige clusters meander throughout Pendle Hill™ to create a mesmerizing effect accentuated with darker specks to attract additional interest. 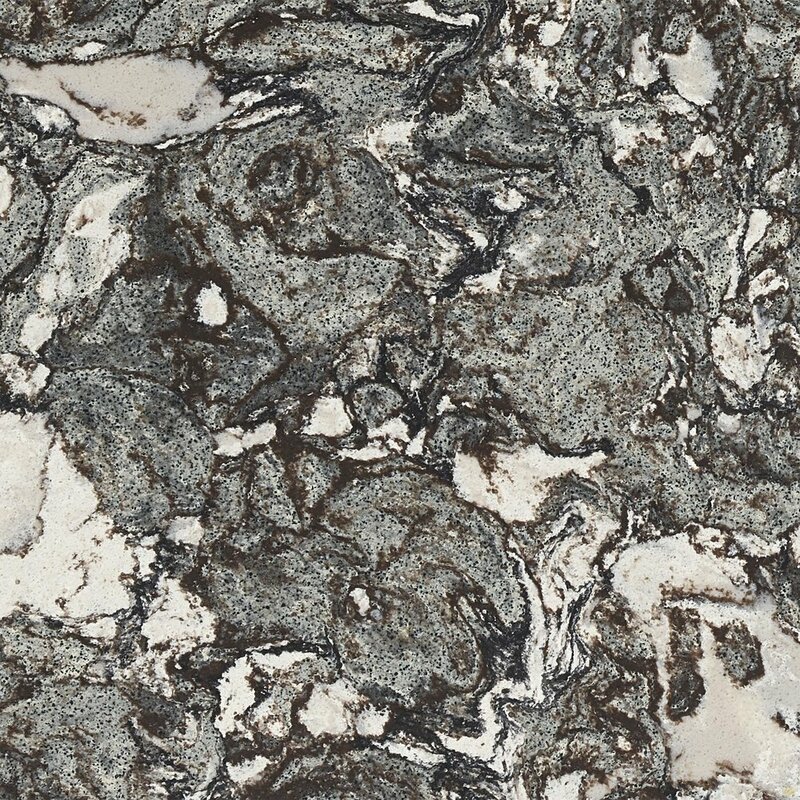 Did you know that our office keeps samples of every Cambria Quartz design on hand? While we think that the Cambria Studio is a fantastic resource for those considering Cambria for their project to get large scale ideas and inspiration, we also know that sometimes it simply isn’t feasible for clients & kitchen/bath designers to make the journey to Toronto fit into their busy schedules. That’s where we come in. While our office showroom is tiny, we do keep samples of every design on hand for clients, designers and contractors to help the selection process. We have just enough space for you to bring your cabinet, paint and tile samples with you, so please feel free to bring your other design choices along to help narrow down your selection! While we don’t use our showroom as a sales centre, we do employ highly knowledgeable staff who can help answer any questions you may have about Cambria & Quartz Craft, from the process of getting your countertops, to the properties & qualities that make Cambria such a special product. We welcome drop bys, so if you are in the Newmarket area, we’d love to have you! Our address is 355 Harry Walker Pkwy, N, Newmarket ON. Our hours of operation are Mon-Fri, 8:30AM-5PM. If you or your designer/contractor have any questions, please do not hesitate to give us a call at 905-967-0949. Black and white kitchens are classic for a reason - they never get old! While we are all for the current trend towards colourful kitchens, we will never stop appreciating the simple glamour of a black & white kitchen. If you’re looking to renovate your home in a way that will look fresh for years to come, a small colour palette in neutral tones is a great option. The wonderful thing about a black and white kitchen is that while it is certainly neutral, it can be as dramatic or as subdued as suits your personal preference. Today we’re sharing three incredible spaces with a simple black & white colour scheme, but each with a completely different look & feel. Above, this kitchen is a minimalist masterpiece. Cambria’s Blackpool Matte design is a serene & luxe look which elevates the simple wooden backsplash & neutral wood cabinets. Using both a black countertop & backsplash is a bold design choice - but in this space it has absolutely paid off! By including warmer tones in the cabinets and accessories, this space feels like a zen modern space - both minimal but also welcoming. When using black and white, accents feel magnified because of their relative uniqueness in the space, which means simple changes to accessories will have a big impact on the feel of your kitchen! Lastly, above, we have an ultra-modern monochrome kitchen. We love the futuristic & clean feel of this kitchen! This design is completely black and white, and features chrome faucets for a sleek look. Because the cabinets & backsplash are so simple, we love the gorgeous choice of a dramatic Brittanicca island to create directionality and organic movement in the space! Both the island and perimeter countertops are in Cambria’s Matte finish, which adds warmth and a soft-touch feel that softens the look of this contemporary design. We hope you enjoyed seeing how a single colour palette can be taken in 3 different design directions! There’s no doubt about it - natural stones like granite & marble are beautiful. We love the way natural stone combines the infinite shades of nature with a plethora of different degrees of movement & veining. What we don’t love, however; is the maintenance & porosity of all natural stone. We believe homes (especially high-traffic areas like kitchens and bathrooms) are for living - not for worrying about staining or chipping your countertops! Combining our love of durability & warranty with desire for the most innovative & extensive shade range available, is why we believe Cambria is the perfect choice for any project. Responding to consumer demands is a forte of Cambria - its clear from their near 150 design choices and 2 different finish options that you’re likely to have more choice in design with a quartz surface than you would even at a stone shop. Regardless, one thing is abundantly clear - consumers love marble. The soft movement or dramatic veining, shades from soft white to deepest black, the Cambria Marble collection has something for everyone. With over 25 different designs to choose from, it is also both the most popular collection for homeowners, and the most well-rounded. 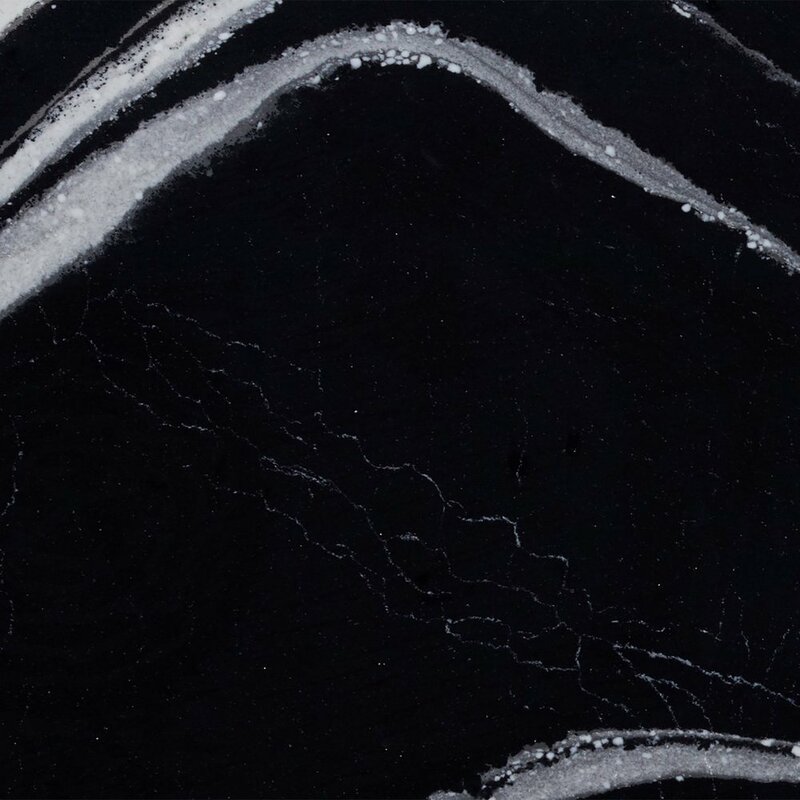 In addition to the Marble collection, Cambria has also recently created a new collection, Black Marble. In response to a growing shift in the design industry to deeper, moodier & more dramatic spaces, the Black Marble collection features marble-look designs with dramatic depth & movement. We hope sharing these designs today inspires & excites you as much as it does us! A renovation is always an investment of both time an money. When deciding what you want to include in your project, considering who you want to work with is just as important as deciding what materials you want to use. Quartz Craft understands that your home is likely the space you will invest the most into, and we want you to be absolutely thrilled with the end result. That’s why we supply & install Cambria Surfaces - we believe in the product, as well as the warranty that accompanies it. 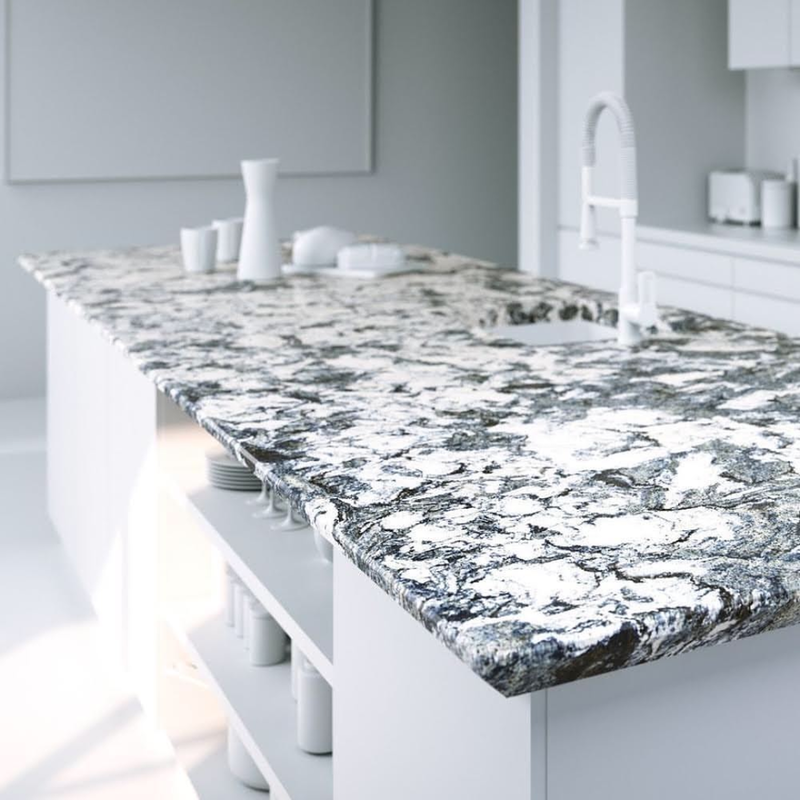 There are many reasons to choose Quartz Craft to install your Cambria Surfaces, namely experience, customer service, and quality of workmanship. These principals are what have led us to be the top-rated Cambria provider in Ontario, based on customer feedback. If you’d like to learn more about what makes Quartz Craft different than other providers, click here. The timeless look of old-school glamour has a few hallmarks. Firstly, golden, gilded & gleaming hardware. Second, a heavy dose of dramatic and glamorous black, which makes gold pop and white look ultra-crisp. Third, geometric lines, strong shapes & repeating patterns. 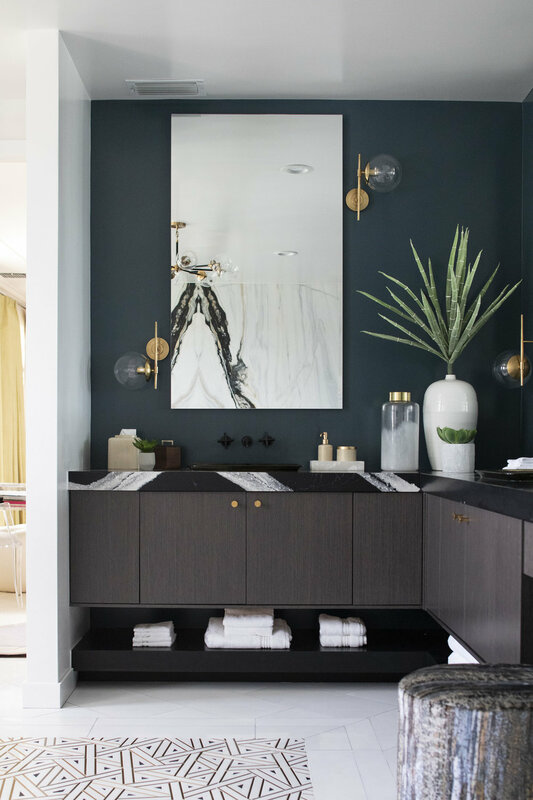 We’ve seen a huge shift toward classic ‘20s styles in the last few years, and today we ere able to round up a few absolutely stunning Cambria-clad bathrooms which incorporate many of these classic design elements, in their own uniquely modern ways. Featured Design: Rose By Design: Sire Design. 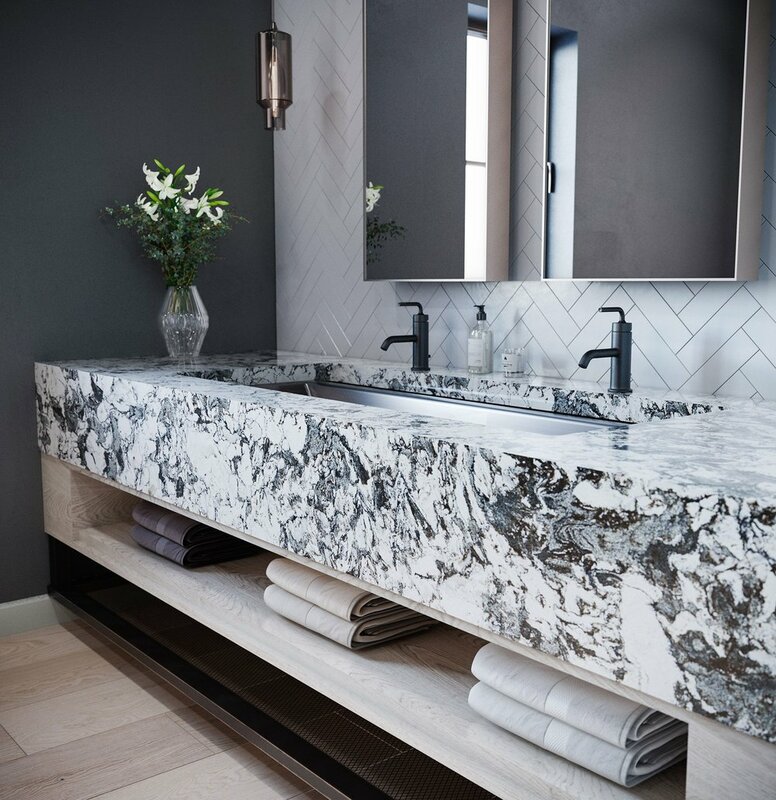 Rose Bay: A white foundation is infused with robust black marble veining, creating a striking abstract effect where opposites definitely attract. The bathroom can be a great space to go a little more dramatic than you may be comfortable with in larger spaces. While still a large investment, the smaller scale of these rooms means that ultra luxe finishes can have a huge impact, and a little goes a long way! Featured Design: Levven Design: The Frances Chicago John Stoffer and Maura Stoffer. Levven: Muscular currents of gray, black, and white surge like tumbling river currents trying to break free from the determined grasp of rocky banks. Each of these spaces features a stunning Cambria design feature. 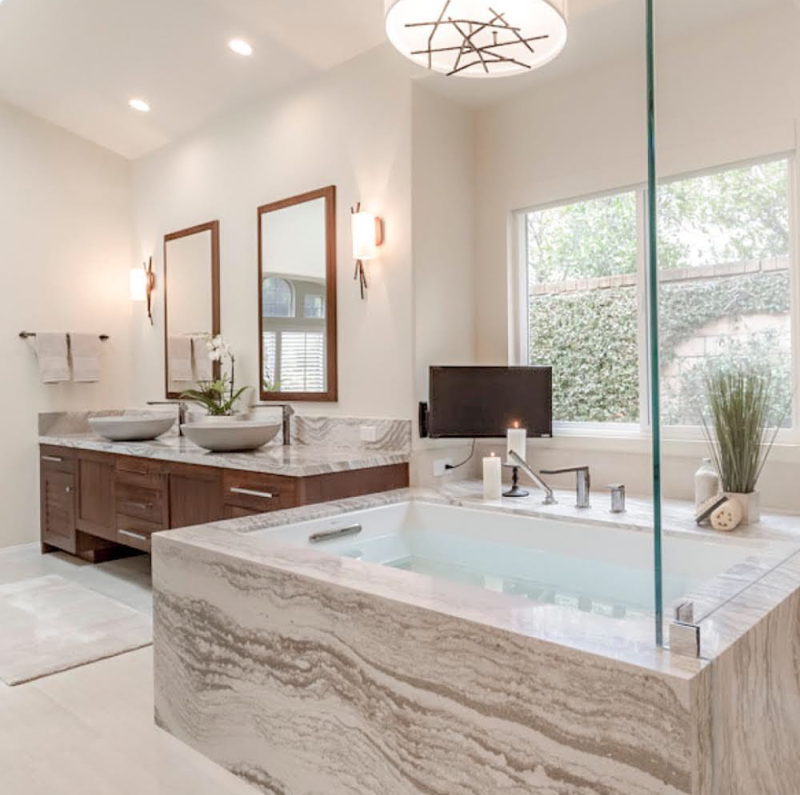 From wall cladding, vanity tops & backsplash to a custom-made, entirely Cambria vanity, each of these bathrooms showcases a way in which Cambria can be used to create your dream bathroom. Wherever your design takes you, there’s a perfect Cambria design & flawless Quartz Craft install to bring it into reality. Summerhill: Calm and serene with dramatic accents, Summerhill is named for the Welsh coastal village where stately clouds drift gently out to sea across a silver-dappled sky. As always, because Cambria is both stain & scratch resistant, it is an awesome choice for a high-traffic area like a bathroom. Whether designing a space for your own use, or a commercial space, you can rest assured that Cambria will make clean-up a breeze - just use soap and water! Because Cambria is non-porous, it is also excellent for frequently damp areas - a healthy choice for your home. Mersey: Mersey is a deep, glassy black daubed throughout with white streaks that flash like lightning against a starless night sky. One of the most exciting things about choosing Cambria for your home or commercial project is choosing which design will complement your space best. With over 145 designs to choose from, there is bound to be something perfect! Often, a great way to start narrowing down which design is right for your project is to first determine either which colour you desire (i.e: knowing a predominantly white or grey toned design is your first choice) or by how much movement you want within the design itself. For example, if you know you want dramatic veining for bold impact, the Marble, Oceanic or Coastal Collections are a great place to start. If, however; you’re looking for something subtle, but with the incredible performance only Cambria can offer, we suggest giving the Desert Collection a closer look. The Desert Collection is Cambria’s most understated collection of designs. Featuring powder-fine granules of quartz, these beautiful toned designs feature absolutely no movement - meaning no veining across the surface, and very little variation of tone throughout the design. 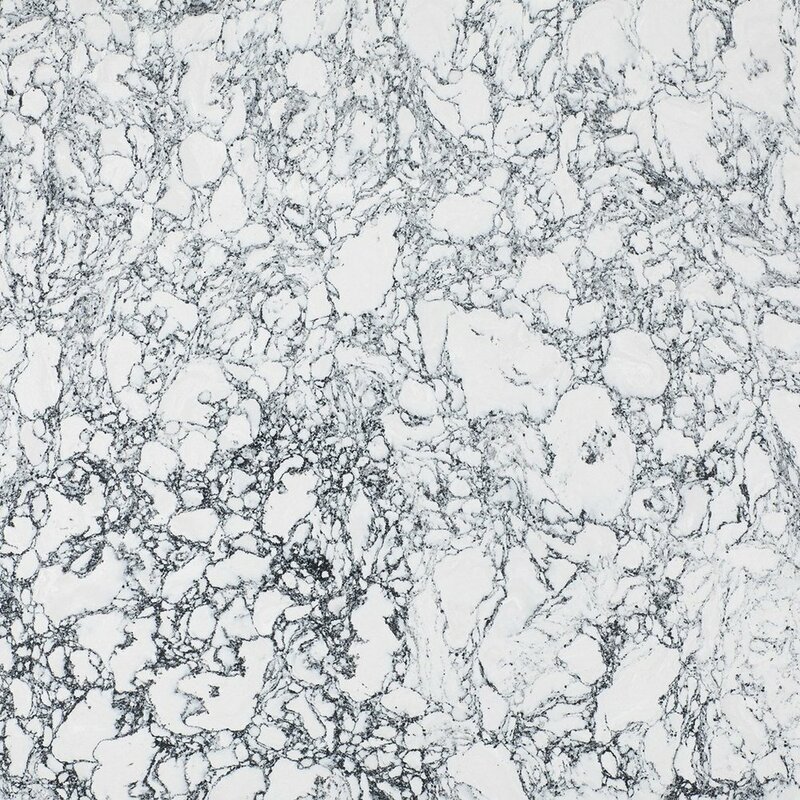 Although these designs are composed of tiny particles of quartz, the amazing innovation of Cambria’s manufacturing process ensures that these designs perform the same as those of any other collection - they are still 93% pure, white quartz, have the same stain and scratch resistance & non-porous nature of all Cambria products. Guaranteed. Today we’re sharing 3 of our favourite designs from the Desert Collection, because sometimes these understated designs get a little overlooked! But in the right setting, there’s no question these designs truly shine. Offering a creamy, understated elegance, Kentmere™ is a buttery-yellow beige confection that emanates simplicity and serenity like life in the quiet English countryside. Dauntless and self-assured with a jaunty nautical flair, Hadley™ is inspired by the deep blue skies and faint winking stars high over Hadley Wood near Hertfordshire in southern England. Whether your overall design is subtle and soothing, or bold and brave; there’s a Cambria design to complement your vision perfectly. While we love a calm & welcoming design scheme very much, today is about 3 ways you can up the energy of any space by incorporating Cambria. While all three of these ideas are absolutely translatable to a softer design (think Delgatie, Torquay, Swanbridge for starters), they look incredible with the bold looks chosen by their respective designers. Our first recommendation is for a one-of-a-kind piece of furniture in a statement colour. The design collections which tend to have the most dramatic movement and colour are the Marble, Oceanic and Coastal collection. These collections feature heavy organic veining and a selection of tones & finishes to suit any space. Ask us today about a custom piece for your home! 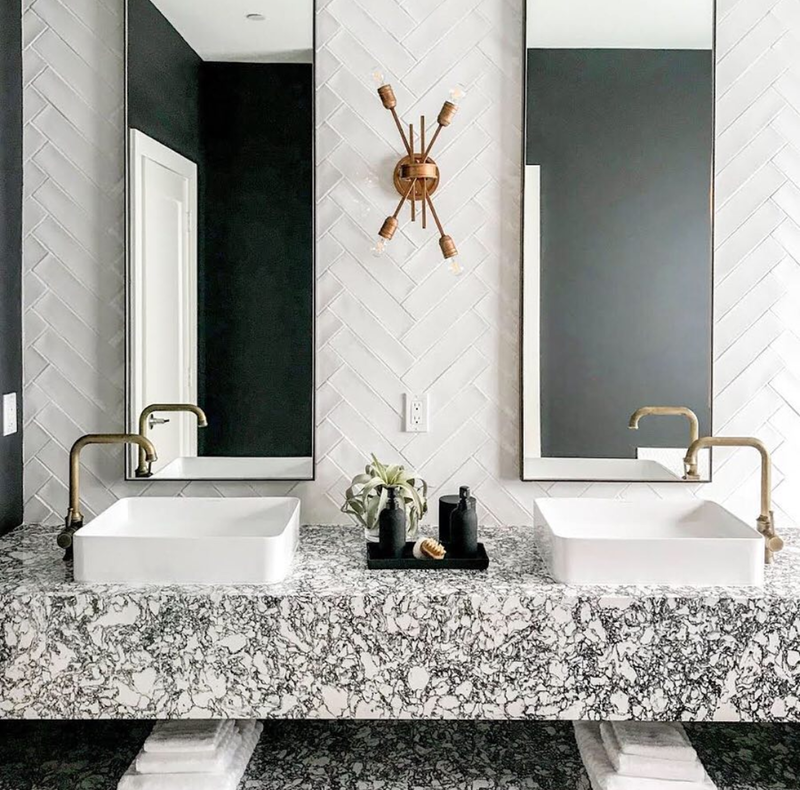 The second way to add a bold splash to your space is to consider a number of coordinating features in the same design as they did in this stunning bathroom. Cladding both the bathtub, vanity top & backsplash in Cambria’s Oakmoor design creates a striking statement that feels both bold and cohesive. Our last suggestion for a bold look in yuur home is to consider the vertical. 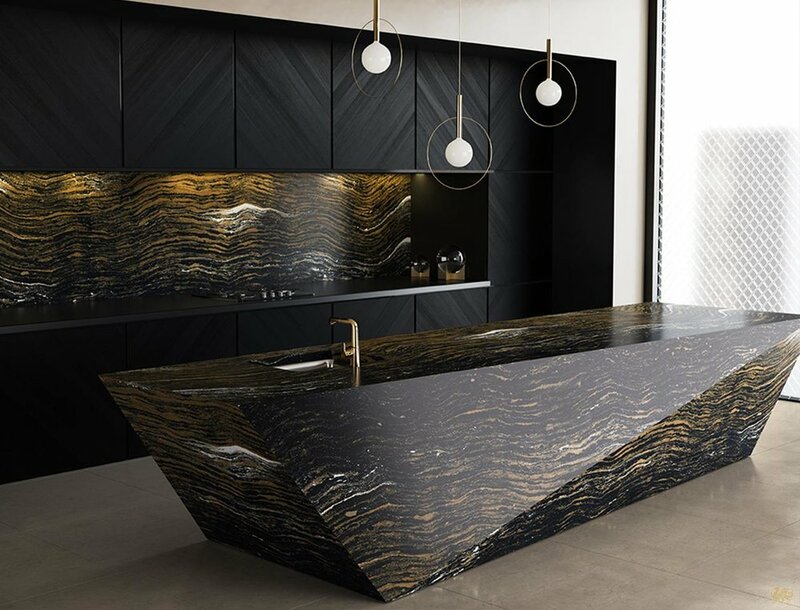 Using Cambria in an unexpected way is a twofold design statement - a super luxe material in a bold design used vertically is about as striking as you can get! This gorgeous kitchen uses Skara Brae on both the large center island and as ceiling-height backsplash behind their stovetop. Handily, the stain-resistance of Cambria makes it a practical choice for this area as well as a truly beautiful design feature. When it comes to Cambria when installed by Quartz Craft, your imagination is truly the limit. We love taking your vision and making it into a reality - ask us today how we can help! Most homeowners are looking to create unique spaces that reflect their personal taste. Cambria and Quartz Craft understand this. With Cambria’s huge palette of designs to choose from & Quartz Craft’s incredible workmanship & experience, we install Cambria in some truly incredible ways. The designers and K&B’s we work with are always pushing the boundaries of design innovation, and we’re happy to meet the challenge. One way that Cambria stands out from the rest is by offering 3 designs which can be backlit. These three designs can be used as paneling, or be custom cut to reflect a logo, coat of arms or abstract design. Lit from behind, these designs truly glow in a magnificent way. Smooth and supple like the well-worn steps of Wales’ historic New Brighton Lighthouse, this stone has all the depth and movement of marble. New Brighton is adorned in stately shades of tan and taupe, touched by swirls of cream. Above, two examples of the gorgeous warmth of New Brighton when lit from behind. Backlit designs are perfect for spaces like wine cellars & bars. Commercial applications such as boardrooms & reception desks are also incredible spaces to stand out from the crowd with a custom backlit design. While each of these designs can be backlit - and look incredible - they are also stunning when used conventionally. With the same quality, purity and durability of all Cambria designs, they perform in exactly the same way as any other design choice. These designs are non-porous, maintenance free, stain resistant, scratch resistant & available in either Matte or High Gloss finishes - plus the added option of translucent backlit drama! Contact us today to learn more, view samples & find out how to include Cambria in your next home or commercial project. Happy New Year! As we move into the first few weeks of 2019, many of us will be thinking about home improvements we plan to make this year. One of the keys to a successful renovation is adequate planning - knowing what style, colours, textures & products you want to include in your project before you start is essential, not only to reduce decision-making during your project but also so your timeline proceeds smoothly. Pacing your project means you aren’t waiting for materials or products to arrive, and gets you into your new space faster! To plan the timing of your Cambria countertop, keep in mind that between template (when we arrive at your house to measure your custom countertops) and install is about a 2.5 week lead time. When you place your order, you can request your template date for when your cabinets are completely installed. Remember, once we have measured for your countertops, no cabinetry can be moved or adjusted. Placing your order early increases the likelihood that you will receive your requested template date! We have a complete list of how you can prepare for template & install here. Of course, choosing reliable & competent trades is also essential to a smooth project - and with 20+ years in the countertop industry & the best Cambria customer service rating in Ontario, Quartz Craft is the natural choice for your home. Part of planning your project is of course considering your kitchen or bath’s aesthetic! We’re sharing our 3 top trends for 2019. Read on to see if any of these trends will make the cut for your home! The first thing we expect to see in 2019 is more colour. There’s no doubt that the white kitchen still reins supreme in design, but a notable shift is underway. Deeper tones are certainly trending - think rich navy and deep greens - but also taupe, warm cream and dark grey are making appearances. Significantly, warmer tones will be something we see moving forward - both in wood cabinetry and in accent colours. The mix of metals has been a huge trend for the last few years - and one we personally love! However; in 2019 we think the use of multiple metals is on the way out. Hardware in either one tone only, or in a non-metallic accent will be more common. A more streamlined approach to design is the motivation behind this shift - people are looking for classic, minimal spaces which feel relaxing and calm. One way to create a cohesive space is to use a simple design structure - and one finish for faucets, lighting, appliances and cabinet hardware is a simple way to achieve this. This is one trend we think is exciting, but a big departure! With the release of multiple shades of stainless steel (Whirlpool’s Susnset Bronze finish is a must see as well), we think more and more people are going to opt for the Blackened Stainless Steel finishes. Sophisticated, deep and moody, these appliances will dovetail beautifully with the trend for more & richer colours. Only time will tell if dark appliances make a true comeback, but we’re excited to see the new designs which incorporate these chic machines! The festive season is well and truly upon us! While we love this time of year for its shimmering lights & decorated trees, today we’re sharing understated and winter-inspired decor ideas. These simple, quick and elegant ideas are awesome for anyone celebrating a toned-down festive season, or simply want to bring a little bit of the frosty beauty of winter indoors at this time of year. This gorgeous white-on-white kitchen really nails seasonal decor, without going over the top. We love the fresh boughs of evergreen paired with a simple felt garland. Placing an understated feature like this next to a high-use area is such a great idea - it might make washing the dishes just a little more fun! If you’re loving the white-on-white scheme of this space, try pairing your white cabinets & tile with Cambria’s stunning White Cliff or Whitehall designs. With a white countertop its imperative to trust the stain-resistance of your product, and Cambria is simply unmatched when it comes to durability & stain-resistance. We love this sweet idea! It is perfectly elegant, seasonal and super easy to do. We could even see this being a fun craft idea to share with the kiddos in your life. Paired with gorgeous Edison-style bulbs, this is frosty, seasonal and bright. This wide windowsill affords the perfect place to perch a few seasonal candles. Did you know we can also install custom window thresholds? For the ultimate luxury touch in your kitchen or bathroom, a windowsill in a matching or coordinating Cambria designs is a fabulous option. This simple idea is perfect for a minimalist home. Bare branches, pine cones and candles are the quintessential winter decor accessories. We also can’t help but eye that gorgeous coffee table. While we often think of Cambria just for the kitchen or bathroom, we also highly recommend it for your hardest-working furniture. Coffee tables are especially high-use articles of furniture, often home to food and drink on a daily basis. Ask us about a custom Cambria piece for an existing coffee table base you might have - it is super easy to make a chic & durable switch! It doesn’t get easier than this! Simply adding a sprig of evergreen to your existing decor is a no-fail solution to seasonal decor. 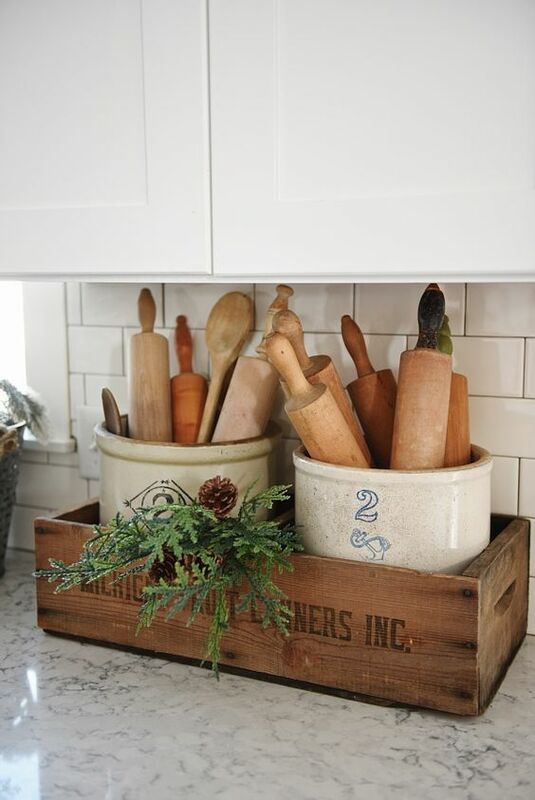 We love this homeowner’s eclectic collection of vintage rolling pins! Adding a touch of winter is just the icing on the cake. 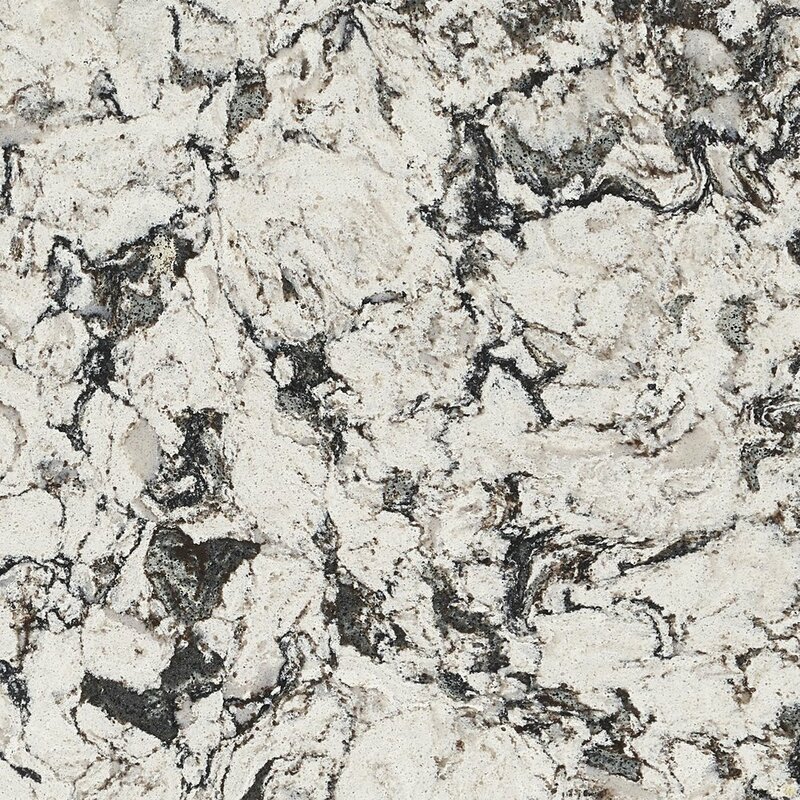 If you love the look of this countertop, we recommend either Cambria’s Rosedale or Berwyn designs. Both stunning designs feature this distinctive marbled movement, but guarantee performance & a safe and healthy food preparation surface for your home. If you have any questions, want to see samples of any Cambria design or are ready to get started with your custom countertop project, contact our friendly staff today! We’re happy to help, no matter what stage of your project you’re at. Rounding out the fall collection of design additions from Cambria, we are excited to share 3 additiona; designs. These, like all Cambria designs are surpassingly beautiful & composed of Cambria’s signatuer premium pure, white quartz. As any chef knows, the quality of the meal is dictated by both the quality of ingredients & skill of preparation. When you purchase a Cambria countertop from Quartz Craft Countertops, you can be assured that you are receiving a superior product and a superior install. Beautiful craftsmanship & friendly service are Quartz Craft’s hallmark, and when you add the durability, warranty and maintenance-free properties of Cambria, its a recipe for a lifetime of enjoyment in your kitchen or bathroom. A translucent, whitish-gray, crystal-like base is adorned with white wisps and large brushstrokes to create exceptional depth and character. This design can be backlit. A white neutral transparent foundation is underscored with a dappling of fine-grain crystals. This design can be backlit. Ensuring the perfect match for components of your space is critical to the success of your design. Cambria offers the most comprehensive palette of designs available, because leading the market with beautiful designs is part of their ethos. Offering cutting edge designs with the same unbeatable durability, strength & maintenance-free properties makes a Cambria countertop the natural choice for your home. Today, we’re introducing 3 new designs. These designs are rich, opulent & dramatic. We hope you love them as much as we do! Today we are very excited to introduce 3 stunning new designs to the Cambria Design Palette. These three designs are sophisticated, cool tones and the perfect fit for a dramatic yet refined space. Read on to be introduced! 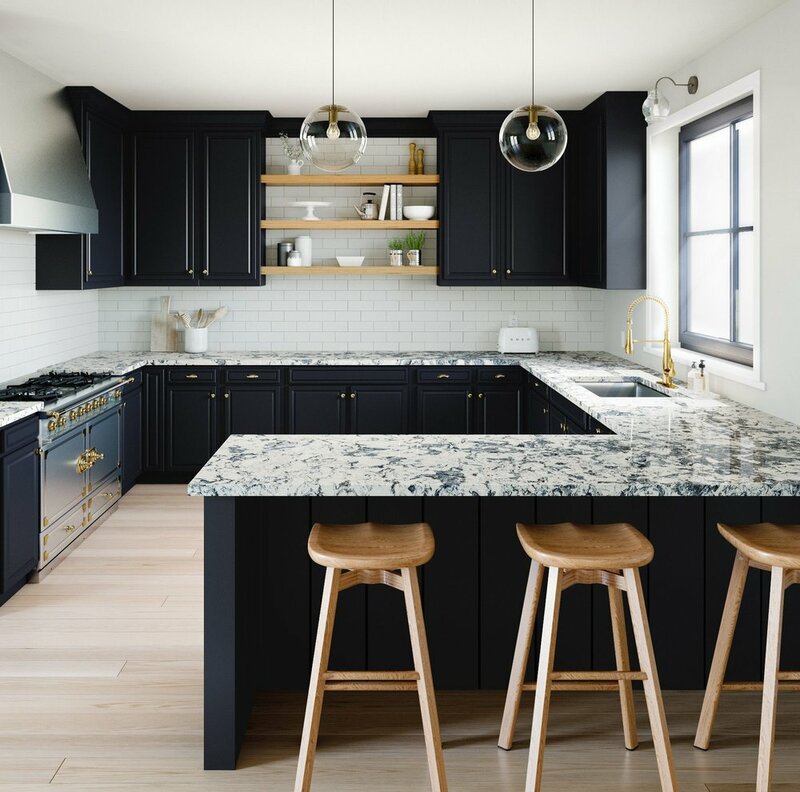 Black, navy, and other blues are the new colors to choose to create an ambiance that’s cool, composed, and on trend for your kitchen or bath. Bentley™ offers classic black and white style artistically updated in a brand new way. Islington™ and Mayfair™ present up-to-the-minute elegance and versatility to harmonize beautifully with other popular colors and fashionable mixed-metal treatments. Grey is one of the hottest shades in kitchen & bath design. Both neutral & sophisticated, using grey is an excellent way to strike a balance of drama & utility in any space. Cambria offers a stunning array of grey designs, from deepest charcoal to lightest fog, so we know you’ll find the right design for your project. We’re sharing 5 of our favourite grey designs here today to give you a peek at the beautiful stable of grey shades we have to offer. Along with offering the most beautiful countertops in the world, Quartz Craft Countertops provides first class service & stunning workmanship. Our signature is a flawless install and friendly, knowledgeable staff who help you along this important part of your renovation. Contact us today to get started!